Cast iron pipe has long been the standard material for conveying water and sewage in municipal, utility and industrial piping systems. The life expectancy of cast iron pipe is unknown but is estimated to be 100 years or more. The oldest operating cast iron main is in Versailles, France, which was installed in 1664. There are more than 500 members of the Cast Iron Pipe Century Club, a unique organization composed of cities or utilities in the United States and Canada that have cast iron pipe still in service after 100 years. Ductile iron pipe, a product of advanced metallurgy, offers unique properties for conveying water under pressure and for other piping uses. It combines the physical strength of mild steel with the long life of gray cast iron. Ductile iron offers the greatest possible margin of safety against service failures due to ground movement and beam stresses. Virtually unbreakable in ordinary service, it also provides increased resistance to breakage caused by rough handling in shipping and installation.The corrosion resistance of ductile iron pipe has been proven in a wide variety of accelerated tests to be at least the equal of gray cast iron. Ductile iron is made by adding a closely controlled amount of magnesium alloy to a molten iron of low phosphorous and low sulfur content. The magnesium alloy addition produces a remarkable change in the microstructure by causing the carbon in the iron to assume a spheroidal or nodular shape (as contrasted to the flake form of graphite in gray cast iron), and at the same time, producing a finer grained iron matrix in the surrounding ferrite structure. As a result of this remarkable change, a far stronger, tougher, and ductile material is obtained. In addition to the benefits of long life, corrosion resistance, high structural strength, and tight joints, ductile iron is also readily machinable, an important requirement in any pipe that must be drilled, tapped, or cut. 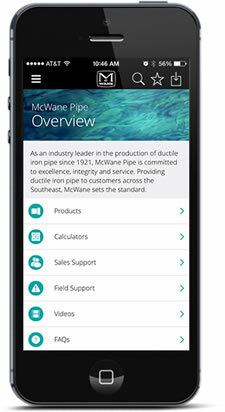 McWane Ductile manufactures ductile iron pipe in strict accordance with design criteria that has been developed by the American National Standards Institute and that equals or exceeds the requirements of all published standards of the American Water Works Association.